Addix’s Great American Giveback champion Fruitport High School in Michigan recently played its “cause game.” Fruitport, which won the Gilda’s Club Grand Rapids “cause game” category, played its Trojan Strong game on September 14th. Photo from Fruitport’s Facebook page. Through the Great American Giveback social media competition, Fruitport won fifty “cause game” jerseys from Addix for its game against Union High School. 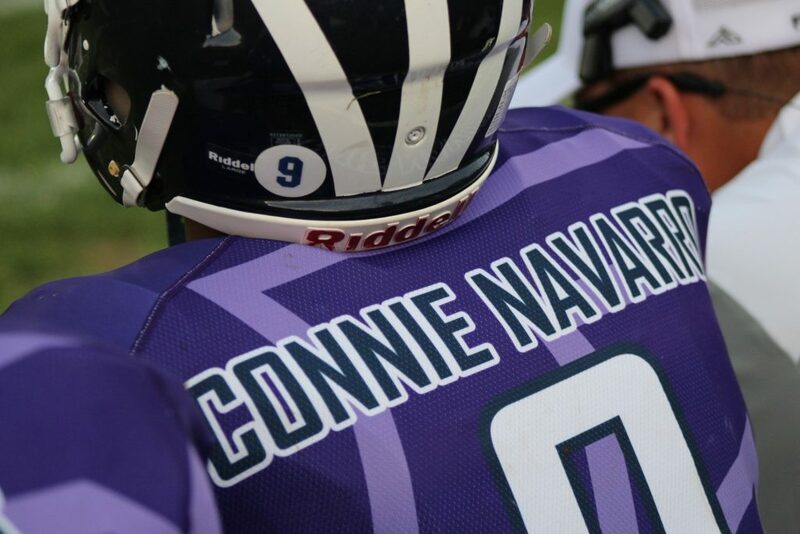 Each jersey had the name of a loved, who has been affected by cancer, on the back. The Gilda’s Club Grand Rapids logo was also placed on each jersey. Gilda’s Club Grand Rapids provides free emotional healthcare to children, adults, families, and friends on any kind of cancer journey or those grieving the death of someone in their life due to any cause. Gilda’s Club is 100% supported through charitable gifts. “I cannot express how meaningful Friday night was for our community. Hope is the only word that can come close to encapsulating the event. After our players presented the jerseys, lanterns were lit off. As they floated up, it was very powerful imagery, but the beauty was in everyone eyes being drawn to the night sky,” said Fruitport head coach Nate Smith. To make the night perfect, Fruitport beat Union 41-0. Coach Smith added, “One of the more powerful behind the scenes moments for me, was writing down the quotes each player prepared as they presented the jerseys to those they played for. They each came in my office and shared what they wanted to have read. To have 15-18 year old high school guys, fully engage in the process and that moment, and for the them to wrestle with saying something meaningful, was unbelievably humbling. Next year, Fruitport hopes to get more teams and clubs involved and expand the “Trojan Strong” Cause. Editor’s Note: A portion of this story appears on the Addix blog. For More information on Addix, one of the leading providers of custom sports apparel with 100 percent of its products manufactured in the United States, and its giveback games, go to AddixGear.com.